(Nanowerk Spotlight) One of the greatest current environmental concerns both for the near term as well as for the future is global warming caused by man-made carbon emissions and its well-recognized impact on climate change. There has been a dramatic increase in greenhouse gases, particularly carbon dioxide (CO2), in recent times. According to the US National Oceanic and Atmospheric Administration (NOAA), CO2 levels in the atmosphere now stand at 387 parts per million (ppm), up almost 40% since the industrial revolution. The largest source of CO2 emissions globally is the combustion of fossil fuels such as coal, oil and gas in power plants, automobiles, industrial facilities and other sources. Fig. 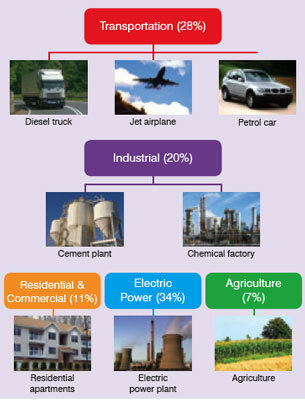 1 shows the greenhouse gas emissions by economic sector in the USA as per a recent survey. The present article will specifically address the first two topics mentioned above while the challenges and technological prospects relating to carbon management will be covered in a forthcoming issue of the Nanotech Insights newsletter by CKMNT. Fig. 2: Various strategies to combat global warming. There are a number of approaches to reduce energy consumption in many major applications and, thereby, have a direct influence on decreasing greenhouse gas emissions. The major impact of nanotechnology on the energy sector is likely to be by way of improving the efficiency of present day technologies to minimize usage of fossil fuels. The transportation sector is one of the major contributors to CO2 emissions (about 28%, according to a report by the Environmental Protection Agency, USA). Therefore, any effort to reduce emissions in vehicles by reducing their weight and, in turn, decreasing fuel consumption can have an immediate and significant global impact. It is estimated that a 10% reduction in weight of the vehicle corresponds to a 10% reduction in fuel consumption (1), leading to a proportionate fall in emissions. In recognition of the above, there is growing interest worldwide in exploring means of achieving weight reduction in automobiles through use of novel materials. For example, use of lighter, stronger and stiffer nano-composite materials is considered to have the potential to significantly reduce weight. Polymers like thermosets, thermoplastics and elastomers reinforced with colloidal silica, nanoclay and nanotubes are promising candidate materials. Employing nanocomposites can lead to reduced energy consumption in cars, with the impact of their use being likely to be even more dramatic in the aerospace sector. It is estimated by The Mitre Corp. that use of CNT reinforced polymer composite airframes in place of aluminum airframes would result in 14.05% decrease in structural mass of the aircraft, and as a consequence, likely to reduce fuel consumption by about 9.8% ("Impact of nanomaterials in airframes on commercial aviation, American Institute of Aeronautics and Astronautics," – pdf downlaod). A number of key players like General Motors, Dow Automotive, Sud ChemieAG, Degussa, Hyperion Catalysis International etc. are intensively pursuing the development of nanocomposites for auto body parts, fenders, exterior panels etc. Another strategy to improve fuel efficiency is by incorporation of nanocatalysts. Enercat, a third generation nanocatalyst developed by Energenics, uses the oxygen storing cerium oxide nanoparticles to promote complete fuel combustion, which helps in reducing fuel consumption. Recently, the company has demonstrated fuel savings of 8-10% on a mixed fleet of diesel vehicles in Italy. Reducing friction and improving wear resistance in engine and drive train components is of vital importance in the automotive sector. Reducing friction can lower the fuel consumption by about 2% and result in cutting down carbon dioxide emissions by 500 million tons per year from trucks and other heavy vehicles in Sweden alone, based on the estimates made by a Swedish company, Applied Nano Surfaces. Nano based lubricants and nanocoatings can significantly reduce coefficient of friction and are being increasingly introduced in the market. ApNano in Israel has developed NanoLub™ lubricant based on inorganic fullerenes? like WS2, MoS2, NbS2 etc. NanoLub reduces friction and wear significantly and to a much greater extent than conventional lubricants, especially at higher loads. The company claims that NanoLub saves money, reduces pollution, is cost effective, safe and environmentally-friendly. Similarly, NanoBoron, UK has developed BORPower® to reduce fuel consumption and extend the lifetime of engines. This is achieved by reducing friction and abrasion during motion via the hard-coating and miniaturized bearing-ball effect. BORPower® contains two active ingredients, namely Mono Crystal Diamond Powder (MCDP) and Nano Boron. According to the company, use of BORPower® results in lower fuel consumption (8-15%), improved engine power (7-9%) and correspondingly lower CO2 emissions (8-15%). Residential and commercial buildings contribute to 11% of total greenhouse gas emissions. Space heating and cooling of residential buildings account for 40% of the total residential energy use. Nanostructured materials, such as aerogels, have potential to greatly reduce heat transfer through building elements and assist in reducing heating loads placed on air-conditioning/heating systems (see p. 21-23 of this issue for an overview of the aerogel technology). Aerogel is a nanoporous super-insulating material having extremely low density (90-95% air). Silica aerogel is the lightest solid material known (density is less than 0.05 g/cm3) with excellent thermal insulating properties, high temperature stability, very low dielectric constant and high surface area. Aerogel is a breakthrough material technology for energy conserving buildings. Use of aerogel interior wall insulation can reduce U-values (U value is a measure of the flow of heat through an insulating or building material; the lower the U-value, the better is the insulating ability) by 44%, lowers energy consumption by 900 kW.hr/yr with attendant reduction in carbon emission of 400kg/yr for apartment buildings. Although, aerogels can make significant contributions to reduce energy consumption for heating and cooling of buildings, their high cost is one of the inhibiting factors in their widespread adoption. Dr. Halimaton Hamdan and her team from the Universiti Teknologi in Malaysia have developed a method of producing aerogels, using rice husks (agricultural waste) as the feedstock that could reduce the production cost of aerogel by 80%. Rice husk has a high silica content, which is the main constituent of aerogel. In addition to potentially being able to produce aerogels at one-fifth the current cost, the above method also addresses the problem of rice husk waste disposal. Aerogel, being a translucent material, also finds architectural applications as daylighting panels with excellent insulating characteristics. Advanced Glazings Ltd. and Cabot Aerogel have recently introduced a new line of their Solera® daylighting insulated glass units that, for the first time ever, will now be available with Nanogel® aerogel (a product of Cabot Corp.), which is a translucent form of silica aerogel. These systems will allow architects to design buildings with glass exteriors having an insulation value ranging from traditional R-2 to unprecedented R-12 (R value represents the resistance to heat flow through a building material. The higher the R value, the greater is the resistance to heat flow and the insulating value). Artificial lighting fritters away a significant portion of all electrical energy consumed worldwide, which represents 20-40% of the primary energy consumption of residential and commercial buildings. The common incandescent light bulbs and fluorescent lamps are highly inefficient, with luminous efficiencies of 10-35 lm/W (5% efficiency) and 50-100 lm/W (20-25% efficiency), respectively. In recent years, new lighting devices based on white-light-emitting diodes (WLEDs) are being introduced in the market. These devices exhibit high luminous efficiency of up to 150 lm/W and long lifetimes (several thousand hours). Inorganic solid-state lighting is partly based on quantum dots while Organic LEDs (OLEDs) rely on nano-scale thin film technology. The LOMOX company of UK is developing OLED lighting technology, which promises to be 2.5 times more efficient than standard energy saving bulbs. This revolutionary technology has a wide variety of applications and, when coated onto a film, could be used to cover walls creating light-emitting wallpaper which replaces the need for traditional light bulbs. RTI International has developed a technology for high efficiency lighting devices by combining nanofiber based reflectors and photoluminescent nanofibers (PLN). These devices are at least 5 times more efficient than traditional incandescent bulbs and are environmentally safer than the compact fluorescent light bulbs as they do not contain mercury. While decreasing energy consumption and improving efficiency is a near term solution, in order to meet the challenges posed by the looming crisis, disruptive technologies based on renewable energy sources will have to be developed. Some promising approaches are briefly discussed below. Thin Film Solar Cells or Photovoltaic Cells: A solar cell is a device which converts the energy of the sun into electricity. This technology has a huge potential, as sunlight is a non-exhaustible source of energy without contributing greenhouse gases to the atmosphere. It is also one of the most attractive solutions, because the amount of solar energy reaching the earth every day is 10,000 times greater than the present world energy consumption. Current solar cell technologies are mainly based on silicon (single or polycrystalline silicon). However, they are expensive to manufacture and have limited efficiency. The high cost of silicon-based solar cells has been the greatest barrier to their widespread adoption. Organic or plastic thin film solar cells are a low cost alternative, mainly based on nanoparticles and polymers, and are now being used to manufacture flexible solar panels. The thin film technology is also cost effective, and uses a cheap polymer substrate coated by a thin film of an active component. The active component comprises either amorphous silicon or nanoscaled CdS, CIS, CdTe, TiO2, ZnO, Quantum Dots, organic materials etc. The material requirement is much less than that in case of silicon wafers and, hence, the costs are further reduced. Flexible substrate technology also enables use of continuous roll processing technique, rather than the step processing technique being used in a semiconductor plant, thereby resulting in dramatic cost reductions. Some of the recent key developmental activities and breakthroughs in the area of solar cells applying nanotechnology are summarized below. Stanford University – Activity: Based on silicon nanowires, a solar cell which has achieved efficient absorption of sunlight while using only 1% of the active material used in conventional designs has been designed (2). University of Texas at Austin – Activity: Spray-on nano-ink of copper-indium-gallium selenide (CIGS), that would allow the rooftops and sides of buildings to be spray painted with nanoparticles and do away with massive solar panels has been developed (3). IBM Corp. – Activity: Low-cost, efficient (9.6%) solar cells using abundant elements (Cu, Zn, Sn, S or Se) and employing thin film technology based on a nano-ink method have been developed (4). Stanford University – Activity: Nanodome solar cells using nano-coating of amorphous silicon have been developed. Nanodome structure captures the reflected light and improves the efficiency of a solar cell by 25% (5). Lawrence Berkley National Lab. – Activity: Thin films fabricated from an array of vertical silicon nanowires are able to increase the light trapping of solar cells by a factor of over 70. This approach represents an economically viable path towards high-efficiency, low-cost thin film solar cells (6). New Energy Technologies – Activity: A technology to spray a solar coating directly onto glass by replacing visibility-blocking metal with environmentally-friendly see-through compounds marks an advance in the development of see-through glass windows capable of generating electricity (7). Fuel cells represent a key enabling technology for renewable energy systems. A fuel cell is an electrochemical device generating power by directly converting hydrogen into electricity at an efficiency that can approach 60% (compared to 25% efficiency for the best gasoline engines), with the sole exhaust product being non-polluting water. The fuel cells and hydrogen energy market was estimated to be US$ 8.8 billion in 2009 and expected to grow to US$ 14 billion by 2014, with a compound average growth rate of 9.6% (8). The key application of fuel cells is expected to be in automobiles, and limited mass production of fuel cell vehicles is expected to begin after 2015. Hydrogen fuel vehicles are capable of eliminating all toxic pollutants from road transport. However, there are a number of challenges to be overcome before the fuel cell car becomes a reality. The high cost of fuel cells is a major obstacle for their widespread adoption. Other challenges include safe and solid storage of hydrogen, and methods of producing and purifying hydrogen. Nanotechnology will play an important role in the efficient storage of hydrogen. A number of nanostructured material systems like CNTs, alanates, nano-Mg based hydrides, complex hydride/carbon nanocomposites, BN nanotubes, TiS2/MoS2 nanotubes and polymer nanocomposites are promising candidates for storage of large quantities of hydrogen (9). A noteworthy development in this area is metal-organic framework (MOF) compounds comprising metal-oxide clusters connected by organic linkages for hydrogen storage applications because of their tunable pore size and functionality. In addition, they offer advantages such as high surface area, low density, and both thermal and mechanical stability. In 2009, researchers from the University of Nottingham, UK have reported hydrogen storage concentration of 10wt% at 77bar/77K with the new desolvated polyhedral framework material NOTT-112. Currently, the most economical way to produce hydrogen is from natural gas; however, it leads to greenhouse gas emissions. The best ?clean? approach to generate hydrogen is by photocatalytic splitting of water molecules into hydrogen and oxygen atoms using sunlight. Thomas Nann and Christopher J. Pickett at the University of East Anglia, UK have successfully demonstrated the photo-electrocatalytic splitting of water to produce hydrogen with an efficiency of 60% (19), employing a new system consisting of a gold electrode covered with layers of InP nanoparticles and including an iron-sulfur complex introduced into the layered structure to produce hydrogen via the photo-electrocatalytic reaction. Another ?clean? process for hydrogen production involves electrolysis of water. Recently, QuantumSphere, Inc. (QSI) has made a breakthrough in the above area using electrodes coated with nano Ni-Fe alloy. These nano-structured electrodes increase hydrogen gas output by 300% at 85% efficiency, making it a commercially viable process for industrial and transportation applications. QSI has also developed a palladium based nanocatalyst which reduces the cost of direct methanol fuel cells (DMFC) by reducing platinum usage by 30 to 50%. The nanocatalyst significantly increases the catalytic surface area, resulting in enhanced durability, extended life cycles, and a reduction in device size of DMFCs. Other key players in the domain of fuel cell nanocatalysts are Nanostellar, Catalytic Solutions and Nanophase Technologies Corporation. The membrane is an important component of a fuel cell, which allows only the positively charged ions (like hydrogen ions) to pass through towards the cathode. Nano-engineered membranes in fuel cells are more efficient and enable building of lighter weight and longer lasting fuel cells. PolyFuel Inc., USA has introduced in the market nano-architectured hydrocarbon membranes for both portable direct methonal fuel cells and for automotive hydrogen fuel cells. These are more durable and less expensive than the state-of-the-art fluorocarbon membranes. Recently, researchers from the University of Calgary in Canada have developed a new membrane based on MOFs that enables a polymer electrolyte membrane (PEM) fuel cell to operate at higher temperatures ? an important step in terms of increasing the efficiency and decreasing the cost of PEM fuel cells (10). Batteries and Supercapacitors: Plug-in electric and plug-in hybrid cars have the potential to dramatically reduce emissions that cause global warming and air pollution, and would also curb our dependence on oil. According to estimates made by the Argonne National Laboratory in USA, electric vehicles would reduce greenhouse gas emissions by 26% over gasoline-powered vehicles and transform the automotive industry. Advanced battery technology is at the heart of this transformation because it determines how far an electric car can travel on a charge and how long it takes to recharge. Currently, the automotive battery market is dominated by nickel-metal hydride (NiMH) or lead acid batteries but experts predict that lithium-ion/ lithium-sulfur batteries would capture the market in the near future. Nanotechnology holds great promise for improving the performance and life-times of the Li-ion batteries. It also has the potential to enhance the energy and power density, shorten the recharge time, as well as decrease the size and weight while improving safety and stability of the batteries (11). A large number of companies such as Altair Nanotechnologies, mPhase Technologies, A123 Systems, Li-Tec Battery GmbH, NanoEner Technologies, Next Alternative Inc., Nexeon Ltd. etc. are actively pursuing the development of nano-enabled batteries while some others are already producing them as summarized below. Altair Nanotechnologies – Product: Li-ion batteries with the anode containing lithium-titanate spinel nanoparticles. The key features are inherent safety, long life and very fast charging. Suitable for EV applications. mPhase Technologies – Product: Smart nanobattery based on superhydrophobic nanomaterials having extremely long shelf life. A123 Systems – Product: The cobalt oxide in lithium-ion cells is replaced by nanophosphate. It allows quick charge, while delivering high power density, with a long life-time. Suitable for use in power tools. The company is also in the process of entering hybrid vehicle market. Li-Tec Battery GmbH (a Joint Venture of Evonik Industries AG and Daimler AG) – Product: Li-ion battery with a flexible ceramic separator membrane technology. It ensures enhanced performance and long service life, combined with increased safety. NanoEner Technologies – Product: Electrodes based on LiMn2O4, LiCoO2, MnO2, C and Si, with nanoparticles of active material integrated into current collector for energy storage devices. Capable of faster charge and discharge than conventional electrodes. Next Alternative Inc. – Product: CNT lead acid battery, which can be recharged in less than 1 hour and has an increased Reserve Capacity (RC) of at least 4 times higher than that of a similar unmodified battery. Nexeon Ltd. – Product: The silicon anode Li-ion battery delivers extended cycle life and significantly increases anode charge capacity almost ten times the gravimetric capacity per gram (mAh/g) compared to carbon anodes. Used in combination with a standard cathode, this can increase cell capacity by 30-40%. Recently, there have been major efforts in enhancing the performance of batteries by the application of nanotechnology, some of which are briefly discussed below. Georgia Inst. of Technology, University of Wisconsin-Madison, Superior Graphite and Streamline Nanotechnologies Inc. – Focus: Fabricated C-Si nanocomposite granules by a low-cost hierarchical bottom-up approach and made anodes for Li-ion batteries. Reversible capacities over 5 times higher than that of state-of-the-art graphite anodes (1950mA/g) High rate capability and stable performance achieved (12). Stanford University – Focus: Developed nanostructured lithium sulfide (Li2S/silicon nanowire) rechargeable battery with theoretical specific energy of 1,550 Wh kg-1 (4 times higher than that of Li-ion battery) (13). Boston College – Focus: Synthesized an anode based on unique hetero-nanostructure comprising two-dimensional TiSi2 nanonets and particulate Si coating. The combined high capacity, long life, and fast charge/discharge rate represents one of the best anode materials ever reported (14). Arizona State University and Fluidic Energy, Inc. – Focus: Developing a new class of ultra-high energy (target energy density 5-20 times higher than that of Li-ion batteries)new metal-air batteries using AKA ionic liquids and at less than 1/3 the cost. Inorganic Specialists, Inc., Ultramet, Inc., and Edison Materials Technology Center – Focus: Developing ultra high capacity anodes based on novel low cost silicon coated carbon nanofiber paper for next generation Li-ion batteries, with three times the energy storage capacity of the state-of-the-art battery with graphite anode, and Li(Ni,Co,Mn)O2 cathode (source). Envia Systems and Argonne National Laboratory (ANL) – Focus: Developing high energy density, low cost next generation Li-ion batteries using novel Si-C composite anodes and high capacity Mn rich layered composite cathodes. The ultracapacitor or supercapacitor is emerging as a key enabling storage technology for use in fuel-efficient transport as well as in renewable energy. The current market is estimated to be US$ 180 million and is expected to double over the next five years (15). Supercapacitors offer a low-cost alternative source of energy to replace rechargeable batteries for various applications, such as power tools, mobile electronics, and electric vehicles. A number of automakers are exploring the concept of combining supercapacitors with Li-ion batteries as a next generation energy storage system for their electric hybrid vehicles. Supercapacitors are able to provide bursts of power and can assist highway acceleration, hill climbing, braking or cold starting and, thereby, can save the battery?s life. Although the energy density of capacitors is quite low compared to batteries, their excellent power characteristics are their main attribute-providing ?bursts? of electric energy that can help the new generation of cars to accelerate at comparable or better rates than traditional petrol-only engine vehicles, while achieving a significantly reduced fuel consumption. Recently, there have been major breakthroughs in enhancing the performance of supercapacitors by the application of nanotechnology. Some of these notable developments in nanotechnology based supercapacitors are summarized below. Nanotek Instruments, Inc. – Achievements: Developed mesoporous nanocomposite based electrodes containing conducting polymer coating/binder for supercapacitors (16). University of Southern California – Achievements: Built a supercapacitor based on In2O3 nanowires and CNT films and demonstrated enhanced specific capacitance (64F/g), power density, energy density (1.29 W-h/kg) and long operation cycles (17). University of Maryland and Korea Advanced Institute of Science and Technology – Achievements: Developed electrostatic nanocapacitors formed in nanoporous anodic aluminum oxide film by sequential atomic layer deposition of metal. Expected to store 100 times more energy. Drexel University, University of Pennsylvania and Lawrence Livermore National Laboratory – Achievements: Nanoporous carbon derived from TiC by etching in chlorine. When used as electrodes for supercapacitors with an organic electrolyte, the hydrogen-treated carbide derived nanoporous carbon (CDC) showed specific capacitance up to 130 F/g with no degradation after 10,000 cycles (18). Harbin Engineering University and Tsinghua University – Achievements: Supercapacitor based on Graphene Nanosheet/CNT/PANI composite was made by in situ polymerization, which exhibits specific capacitance of 1035 F/g (1 mV s-1) in 6 M of KOH, and excellent cyclic stabiliy (19). Nanotechnology has a significant potential to solve or mitigate the problem of global warming. However, one has to approach this issue carefully. Nanotechnology invariably involves use of nanomaterials (nanocatalysts, nanomembranes, nanoparticles, aerogel etc.) and their production requires a significant amount of energy input. If the source of this energy input is fossil fuels, then the whole purpose of reducing CO2 gas emission and preventing global warming is nullified (20). The only option available at our disposal is to use renewable sources of energy, such as, solar or nuclear energy (clean and non-polluting), at every step. The other aspect that needs to be closely examined is the economics of applying nanotechnologies to solve the problem of global warming. This calls for a detailed cost-benefit analysis. Needless to say, firm commitments from major industries and governments alike are also essential. 11. ?Impact of Nanotechnology in the Energy Industry (Technical Insights).? December 2007. Frost & Sullivan, http://www.frost.com/ (accessed May 7, 2009). 16. US Patent No., 7623340 B1, ?Nanoscaled Graphene Plate Nanocomposites for Supercapacitor Electronics,?Inventors: Lulu Song et al., Assignee: Nanotek Instruments, Inc.
18. R. Dash, J. Chmiola, G. Yushin, Y. Gogotsi, G. Laudisio, J. Singer, J. Fischer and S. Kucheyev, ?Titanium carbide derived nanoporous carbon for energy-related applications? Carbon, 44 (12), (2006) 2489-2497. By Y. R. Mahajan, CKMNT. This article will appear in the forthcoming issue of Nanotech Insights. The second part of this article will appear in the following issue of the newsletter.